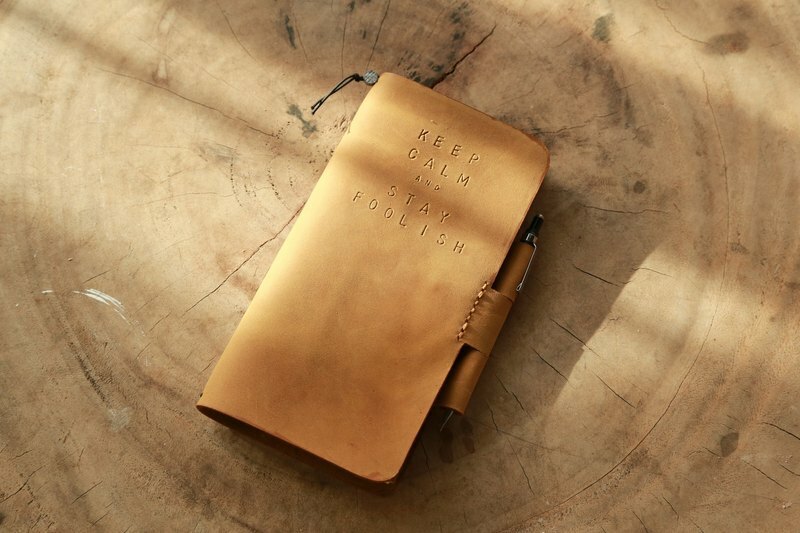 A vintage notebook cover, perfect for traveller. it is included 3 notebook, the pencil is blended into the design. 【Happy Mid-Autumn】 7Sep-31Oct 10% off for any 2 items ( coupon code : heysummer) 12% off for any 3 items (coupon code: happysummer2018) A special gift for Purchasing Over HKD $ 800 Please choose one gift from below https://i1243.photobucket.com/albums/gg541/hykcwyre/giftitemseng_zpsjeajhkd3.jpg * Please remark one gift when check out * Free engrave on gift ( 10 letters ) * Please note that leather and color are randomly selected ***What's New? For Ordering our stitching pack, customers will have 2 hours free to work on their work in our studio in To Kwa Wan, Hong Kong You can: - Instant support from our staffs. - Use our tools and some such as stamping letter, edge paint and many more. - Work on your product at your own pace in our relaxing environment. *New added - semi-stitching pack This is a new experience that allow our customer to be part of our special item crafting process. We will finish some of the difficult process and let the customer continue with the handmade part, it is suitable for those who like DIY. Order process for this item: Stitching Pack: https://i1243.photobucket.com/albums/gg541/hykcwyre/Information/stitchingpackeng_zpswptnzmor.png Finish Product: https://i1243.photobucket.com/albums/gg541/hykcwyre/Information/eng_zpstdrtncob.png https://i1243.photobucket.com/albums/gg541/hykcwyre/Information/brand-concept-engpt1_zpsjwo9yq6l.jpg https://i1243.photobucket.com/albums/gg541/hykcwyre/Information/brand-concept-engpt2_zpsje81qzdk.jpg https://i1243.photobucket.com/albums/gg541/hykcwyre/Information/brand-concept-engpt3_zps68nb8gcf.jpg *** Description This wallet is designed for traveller who want a wallet to organize their properties during their journey such as note, coins, cards and receipts. Copper Stud button closure, we use a long piece of leather to complete the cover and inner base, to less the unnecessary stitchings, minimal and stylish. on one side there is a note pocket, and a L shape zip coin purse, it is design to let you open the coin purse without opening the wallet, a bellow pocket with a total of 6 card slots on both side. All edge are refined and polished. You can also order it as a stitching pack, we will provide the instruction for you to finish this piece. ***Details - Different kinds of leather available - Pen slot closure - 3 individual rubber band - Can be personalise - Suitable for traveller notepad ***Dimensions: Length: 9 inches Width: 5 inches Depth: 1 inches ***Color/leather https://i1243.photobucket.com/albums/gg541/hykcwyre/color%20swatches/c-d-e-color-swatch-combine-eng_zps18ntsbeu.png https://i1243.photobucket.com/albums/gg541/hykcwyre/color%20swatches/s-w-0-color-swatch-combine-eng_zpsixjs9mvm.png ***Leather caring Each customer will receive a small can of our home-made leather balm. Simply apply it on leather every 3-6 months. For leather maintainace, use a dry soft cotton fabric/cloth, gently apply a thin layer of leather balm onto the leather surface, when it absorb into the leather, repeat the same step 2-3 time. *For Italian cow leather (C,E Series) there is a layer of natural wax on top of the surface, it will absorb/drop off upon use, the scale depend on how the user use it. When above 80% of the wax is consumed, you may consider for leather maintenance. ***Personalise * We are able to engrave your favourite quote, initials or names, (Addidtion fee needed for engraving 20 single letters or above) please feel free to send us a convo and we will make it happen. * If you have any request (such as width or specific shape), please feel free to send us a message, we treat your order as priority. * We can also engrave symbols, each symbol size is fixed should you need to know about the dimensions please feel free to contact us. https://i1243.photobucket.com/albums/gg541/hykcwyre/Information/1F1ST56_zpsuzcy7j7k.jpg https://i1243.photobucket.com/albums/gg541/hykcwyre/Information/IfW5sg8_zpscp7ilgrt.jpg ***Engraving Available Font and size : If there are no information about which style of font, we will use style 1 to engrave the word. https://i1243.photobucket.com/albums/gg541/hykcwyre/Information/fontstyle1_zpstp70kqao.png https://i1243.photobucket.com/albums/gg541/hykcwyre/Information/fontstyle2_zpsnugutlhh.png https://i1243.photobucket.com/albums/gg541/hykcwyre/Information/fontstyle3_zpsik8oqd2u.png https://i1243.photobucket.com/albums/gg541/hykcwyre/Information/Fontstyle-4-uppercase_zpshjvql3b7.png https://i1243.photobucket.com/albums/gg541/hykcwyre/Information/fontstyle-4-lowercase_zpsgbx1vgbk.png Only style 4 have Uppercase and Lowercase Let us know if you like our symbol on your product! https://i1243.photobucket.com/albums/gg541/hykcwyre/Information/1Y1A8136_zpswzxzpavp.jpg https://i1243.photobucket.com/albums/gg541/hykcwyre/Information/symbols65-102_zpsfkrgmtkd.png https://i1243.photobucket.com/albums/gg541/hykcwyre/Information/symbols103-113_zpslzxkhvvl.png https://i1243.photobucket.com/albums/gg541/hykcwyre/Information/symbols-114---120_zpsh7n2tij7.jpg *We are able to brand letters in gold / silver color (additional needed) https://i1243.photobucket.com/albums/gg541/hykcwyre/Information/fontstyle_zpsokwlhmmh.png * We are able to engrave monograms, additional HKD$50 is needed, A circle monogram with 32 mm diameter , personalized it with 2-3 initials of your choice. https://i1243.photobucket.com/albums/gg541/hykcwyre/Information/monogram_zpsw09wtrmj.png ***Remarks *Color may vary slightly from screen to screen *If you have any request (such as width or specific shape), please feel free to send us a message, we treat your order as priority. *Please visit my Shop Policies for production lead time and shipping before your purchase: *This case is all handmade, in our little studio located in Kowloon Bay, Hong Kong.